Home / News / New Growing Innovation Video – on Growing through Growing! 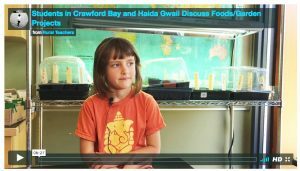 Collected from among the thoughts and words of children involved in two different Growing Innovation-supported project that involve foods work, this video explores children’s responses to projects in Haida Gwaii (at Gudangaay Tlaats’gaa Naay Secondary School in Massett) and Crawford Bay in the West Kootenays (at Crawford Bay Elementary-Secondary School). We’ve got it first among the Voices of Rural Education documentation videos you will find on this site. We are grateful to those with the courage to share with us. Please share, discuss and enjoy!